Genmaicha is also known as “popcorn tea”, as the brown rice grains that pepper these types of blends will often pop while the tea brews. All good genmaichas have strong undercurrents of well-cooked brown rice, giving them a unique taste among teas. Of course, if you don’t like brown rice, genmaicha will definitely not be your cup of tea. To this end, Kyoto Rice is quite a fine genmaicha, and already arrives with some of its rice pre-popped, which may contribute to its very full brown rice taste, which also sweetens the green tea. 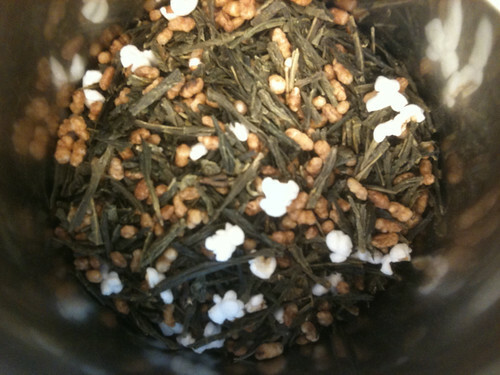 This genmaicha is approachable for those who aren’t the fondest of green tea in general. An aside: I find that Mighty Leaf’s higher-rated green teas (like Green Tea Tropical, which uses a medley of tropical fruit) are approachable in this manner. As an accompaniment to Asian lunches at the office, this tea is unbeatable for me. It’s not flexible enough for me to always desire it, but it’s still quite good. Rating: 3/5—a good, sweet genmaicha.